Can we just a minute acknowledge that Starbucks pumpkin spice latte gets far too much attention? While were on the subject, I'm going to give the unpopular opinion that pumpkin flavored desserts get far too much attention in the fall in general. Don't get me wrong, I love a good pumpkin loaf just as much as the next gal, but a perfectly roasted delicata squash really hits the spot for me. This fall salad is vegan, loaded with fall flavors and can be prepped ahead of time for a work lunch that i promise will make all of your coworkers envious. I give the full instructions for assembling this salad and dressing below, but you can also just follow the instructions for roasting the veggies and use them in grain bowls or other meals. Preheat oven to 425 and prep veggies. Cut stem and end off delicata squash. Cut into 1/2 inch wide rounds and scoop out seeds. Peel and cut turnip and sweet potato into 1/2 inch cubes. Line baking sheet with parchment paper and spray veggies on all sides with oil of choice. I used avocado oil. Season liberally with Himalayan pink salt and pepper. Place in the oven to roast on a middle rack. 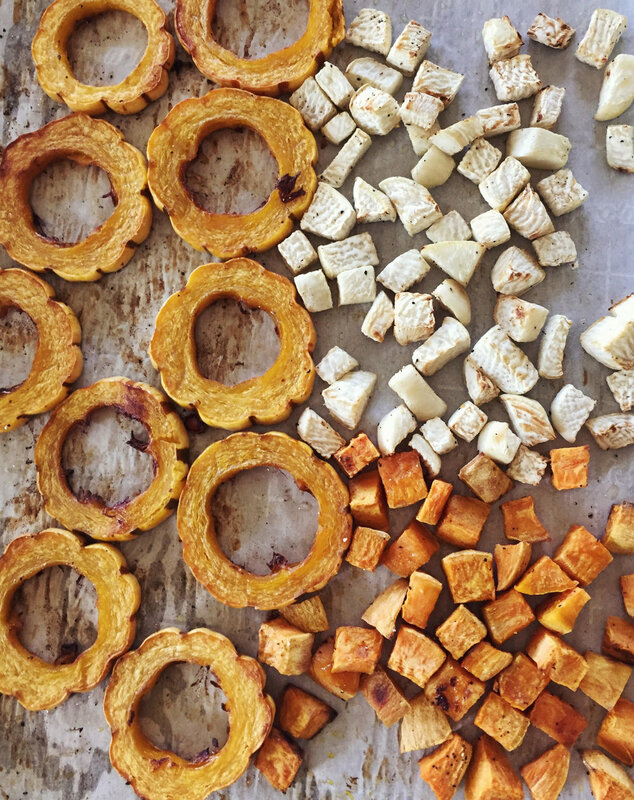 Let roast for 25 minutes and then flip squash and toss cubes. Roast for another 20 minutes and remove veggies from oven to cool. While the veggies are cooling peel and chop the apple or spiralize it if you have a spiralizer. You can also mix up the dressing during this time by combining the ingedients in a bowl and mixing with a whisk or a fork. Place 2 cups of lettuce in each of two salad bowls or plates. Arrange roasted veggies, chopped apple and seeds on top of the lettuce.